"This soup is so easy to prepare and tastes better than most soups you could buy. Mild onion and anise flavored - it's awesome!" Melt the butter in a large skillet over medium heat. Add the quartered fennel bulbs; cook and stir until golden brown, about 10 minutes. Pour in the broth, and simmer until fennel is tender, about 15 more minutes. Ladle into soup bowls, and season with salt and pepper. Follow these simple shortcuts for delicious butternut squash soup. I made this minus the butter and then mashed up the fennel to make the soup. It was tasty but warning that fennel is somewhat of a laxative. Good for diet lovers! 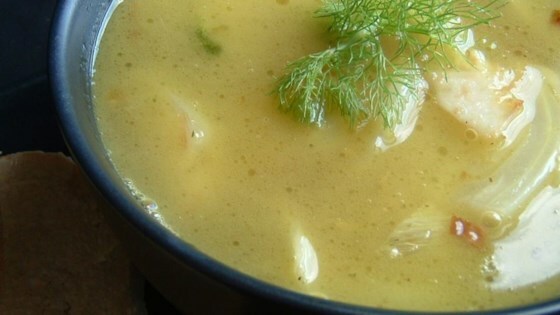 I never knew how much I loved fennel until I tried this soup! It has a delicious, mild flavor; the flavor of the ingredients are really allowed to come through. This could be the easiest 'fancy' recipe ever. Very delicious. Reheats well too.